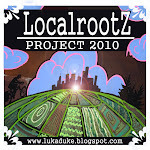 Localrootz Project: Spring projections and kitten reflections. Spring projections and kitten reflections. Spring is creeping in, the grass is greening, buds are splitting and we have some new residents here at the Localrootz Homestead ! Welcome Oak (brother) and Maple (sister) ! We recently adopted these adorable siblings from the Greater Androscoggin Humane Society. They are full of kitten mischief and never leave each others side. Its a bit difficult to see in these pictures as they are both tiger striped but Oak the boy has a couple white paws along with a patch of white on his neck, the girl Maple has no white spots. We are so lucky to have such great kittens after a few months of empty house syndrome since our old girl Merrimac passed on. We are so happy to have the pitter patter of playful paws scurrying through the house and they aren't afraid to get a good lap nap in on occasion as well ! 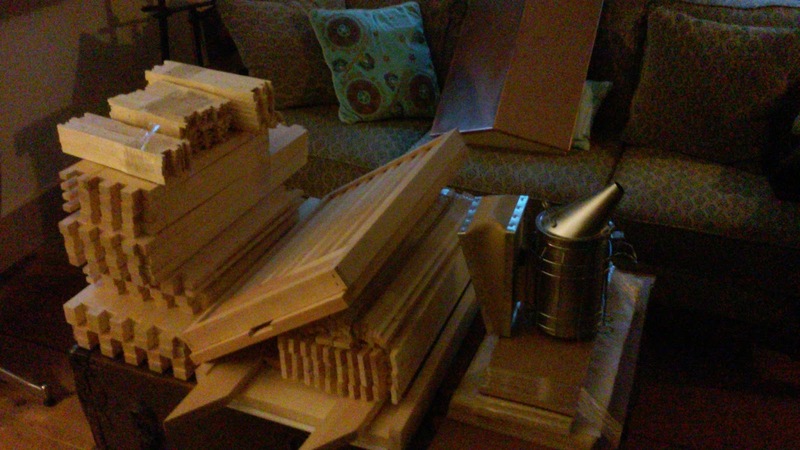 The other spring project other than raising kittens has been the preparation for our first beehive. We spent the winter reading some books on the subject as well as scouring the interwebs for good resources on the subject. One thing we found was there are lots of different methods and opinions on the right and wrong way to do things. After absorbing a handful of these opinions we were ready to give it a shot and start the hands on learning process. Step one was visiting the Portland Honey Exchange where we were able to source all the equipment needed. We chose an 8 frame and with some nudging by the wife we splurged a little and got the copper hive top to add a little pizzaz to the homestead. Assembly was pretty straight forward and required some weatherproof woodglue and galvanized nails to hold up to the elements. 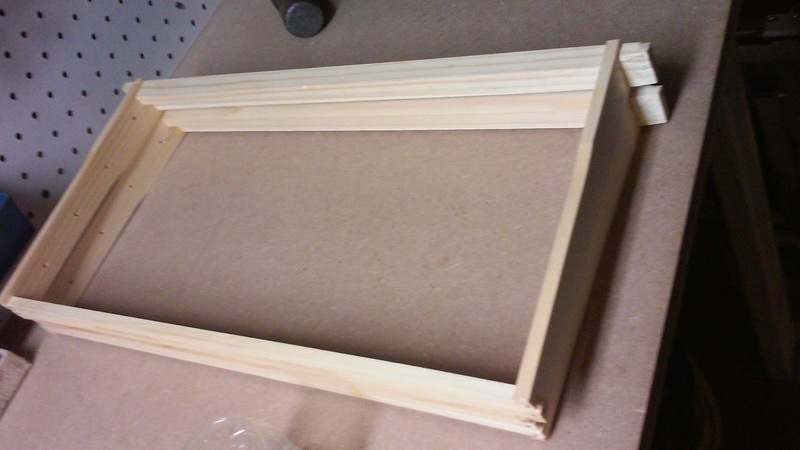 After assembling the hive bodies and honey supers, bee talk for the large and small boxes the frames are held in, it was time to assemble the frames. 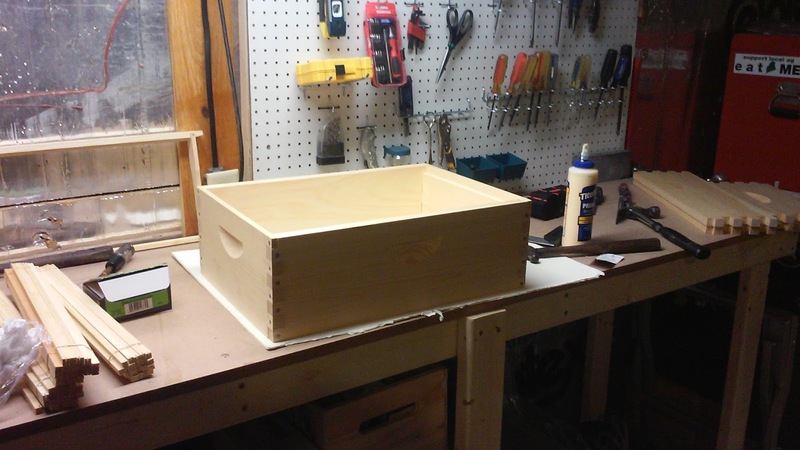 These are the bases or "foundations" for the hive to build their comb for raising brood and making honey ! Inside these frames I laid a base layer of thin embossed beeswax to guide the bees on their journey to produce honey and raise a hopefully healthy and thriving colony. 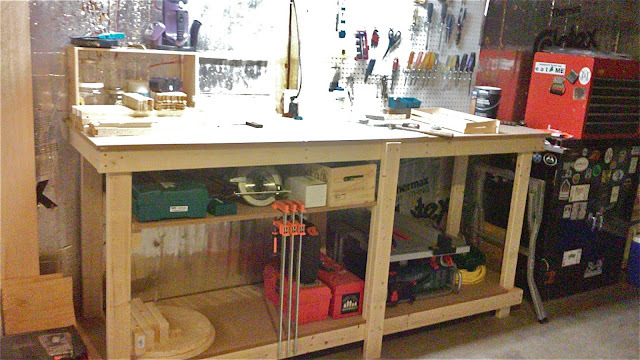 Its projects like assembling the hive that make me glad I spent the time this winter constructing a proper workbench. I still have plans for some extra shelving and a better light fixture but for around $60 in lumber this is sturdy and at a good height for working. The finished hive, as you can see, we decided to use an outdoor stain on the exterior of the box to help protect it from the Maine weather, but still retain its rustic appeal. I cleared the area around it and plan on possibly propping it up even a little higher with a few extra cement blocks before adding the bees this coming weekend. Much more information and stories to tell as our beekeeping experiment gets going ! 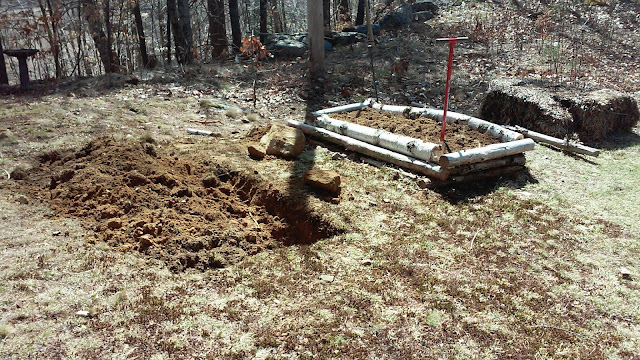 Another early Spring project that we tackled last weekend was establishing a proper asparagus bed. Asparagus is one of our favorite spring vegetables and also one that cost a pretty penny when sourcing it locally and organically. I choose a nice sunny spot located next to last years sunflower raised bed and decided to dig a 18" hole that measured just about 8' x 4'. I realized I had made the right decision going with raised beds last Spring because there was a lot of rocks... did I say rocks, maybe I should use the term boulders. Luckily I used a bit of restraint and managed to not break one of my shovels ! 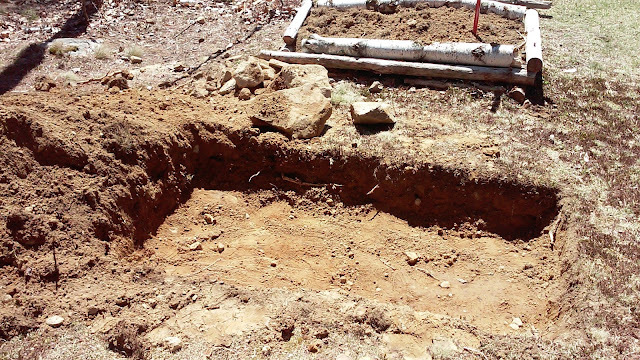 Here you can see the finished hole, I snipped any large roots that were encroaching and lightly aerated the base to allow for decent drainage, though I found the soil actually more sandy and less claylike than I expected. In fact I added a wheelbarrow full to the raised bed next to it and decided that would make for a good potato bed to plant some fingerlings this year... more on that in another post. Following some guidelines in a few of our gardening books, I blended some woodchip compost that was leftover from the previous owners goats and blend it with the organic surf and turf compost blend I purchased from Benson's last year. I then grabbed the Purple Passion Asparagus crowns that I purchased locally from Pinetree Garden Seeds in New Gloucester a few weeks before. I keep them in a dark cool corner of the basement and pulled them out and let them warm to room temperature overnight. Then we filled our compost bucket with warm water and diluted a few tablespoons of Alaska Fish Fertilizer into the warm water and gave it a good stir. Spreading out and gently untangling the 10 crowns I arranged them from big to small. From there I soaked the crowns in the warm nutrient enriched water for a half hour. And finally in the warm spring afternoon sun I spread the crowns evenly throughout the bed and covered the crowns with another 2-3 inches of compost, watered liberally with the enriched water bucket and then a couple fresh pails full too! Well that was a successful weekend to get things going for another growing season and to make sure my back remembers how much it enjoys moving dirt by the shovel full ! 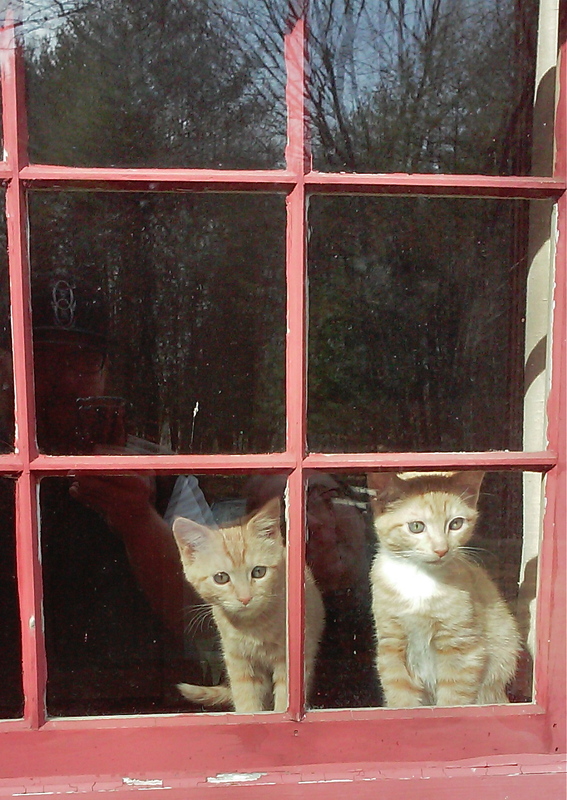 And one more shot of the cute new kitten additions !